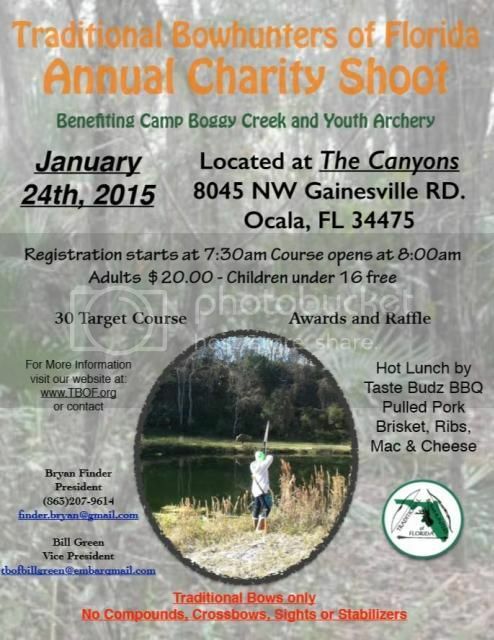 The January 24,2015 Annual charity shoot is coming up..there will be a work day on the Friday before the shoot. The shoot will be at "The Canyons" property near I-75 and hwy 326 in north Ocala. Looking forward to this shoot. Last year's shoot was awesome. What does that workday entail? How can we learn more about it? Work days usually involve.. Pulling targets out of trailers, setting up targets, shooting stakes and possibly a little trail trimming.. And making new friends..volunteers also receive a handful of raffle tickets! There should be more info at the TBOF web site. TBOF.org my home computer crashed or I would post the flyer here..
TBOF also has a "Facebook" page, I assume lots of information can be found there...I don't do Facebook so I havnt seen it..
Is this the same place it was held last year where the zip lines were? I attended for the first time last year and realy enjoyed the shoot. Forgot to mention that I hope to attend this year as well. Yes, "the canyons" zip line place just north of Ocala. Are you folks going to post a flyer with all thr infomation like you did last year, complete with directions on how to get there? I need all the help I can get. OK...thanks for the info...hope to see you there! The Charity Shoot is next weekend.. I need to go thru my stuff and find some items to donate to the Raffle.. I'm bringing some stuff for the Raffle..
Just got back from the shoot. It rained almost all night but stopped arround sun up.. It was breezy but never rained on us today. There was an awesome turnout today around 150 people? I saw some folks from Melbourne, Cape Coral, Tallahassee, Jacksonville.. As always the officers and volunteers worked hard to put this event on! I saw several TBOF folks stopping at the Zipline office after the shoot..I'm guessing they are zipping along as I'm typing this. Great shoot! Great venue! Thanks to the volunteers and officers for setting it up!